The "Fiesta Canaria" is an evening's entertainment consisting of traditional, authentic Canarian music and dance, which you can experience while enjoying fine Canarian food, wine and sangria. The fiesta takes place at an authentic Canarian finca, or farm, called Rancho Palm-Mar. This is situated in the area of Palm-Mar, just outside Guaza. Fear not if you don't know where that is, or how to get there. The Fiesta Canaria uses bus transfers and you will be picked up and dropped off at your hotel or apartment. The venue for this evening is a rustic country house, decorated in typically Canarian style. You'll be able to see how native Canarians of a bygone age lived. On arrival, you are greeted with a glass of sangria, accompanied by the resident musicians playing Canarian melodies. On being shown to your table, you'll find it adorned with a selection of tapas, to whet your appetite. These are closely followed by the first course of Canarian soup. 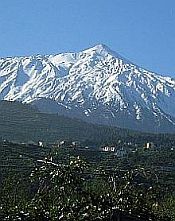 At this point, there is a demonstration of the unique whistling language used on the neighbouring island of La Gomera. Known as El Silbo, it enabled the Gomerans to communicate over great distances - mountain top to mountain top, as it were. Then it is time for the main course of the meal. 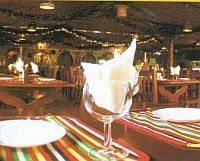 Rancho El Palm-Mar serves uppollo rancho, a dish for which it has an island-wide reputation. It is a traditional spiced chicken dish prepared on the charcoal grill. Throughout the whole evening, drinks are flowing freely - wine, water or soft drinks. There is a well-stocked bar. After the meal, you are entertained by all the musicians and dancers, with native Canarian folk dances. Finally, the evening concludes with your turn to dance! Boogie the rest of the night away on the dance floor, to native, spanish and international music. The evening concludes at midnight and your coach will return you to your accomodation.